Are you one of my email subscribers? If so, you are entitled to join my “I Heart My Email Subscribers Giveaway!” If you are not yet an email subscriber, all you need to do is to SUBSCRIBE and CONFIRM to my blogs using your email. Two (2) lucky emails will be chosen to win of $10 each and another two (2) for $5 each! So, what are you waiting? Join now!! 1. Once you join this giveaway, you agree that you will stay subscribed to my blogs for the remainder of your emails existence. If you choose to unsubscribe and then later subscribe and join my future giveaways, you will be disqualified. 2. Old email subscribers are qualified to join this giveaway provided that they are still active subscribers (confirmed) and fill-ups the rafflecopter widget. 3. Enter the email you used in the “Extra Info” of the rafflecopter widget. 4. A participant can join more than once if he/she uses different emails to subscribe but can only win once. 5. 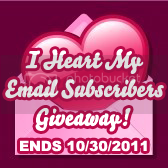 This giveaway starts today and will end on October 30, 2011. 6. This giveaway is open worldwide to all email subscribers with valid Paypal email addresses. I joined! Good luck to all. Thanks, PMO! I am taking part, good luck to all. I hope I will win this time mommy!lol! wow this is a nice contest. will join soon. Great going on this giveaway! 😀 done! hope to win.. I am old subscribers to some of your blogs..thanks for the contest and hope to win..
yay taking part using sherrygo at rockemail dot com. Joining the giveaway. Dati ng email subscriber. Gotta love it! Join me in please. Thank you! hello, please reply to my email? I am awaiting for your response. Thanks! nagbabakasakali 🙂 I am joining mommy Ruby! Joined and blogged about this too! Remember only subscribers to this blog can enter so lets get subscribing! cool contest. it is so great to be an email subscriber of PinayMommy! Mommy Ruby! Thanks for this promo! I am joining and hope to win….